HP has outed the first "affordable" Chromebook that both sports an IPS display and can be charged using a regular micro-USB cable. The 11.6-inch Chromebook 11's panel provides a wide 176-degree viewing angle and will run for around six hours without giving up the ghost, according to HP. 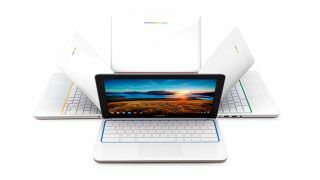 The company says that its design was inspired by Google's super sharp screened Chromebook Pixel notebook. Thankfully it retails at a much more wallet-friendly £229 ($279, or AU$295), versus the Pixel's $1,686 (around £1,049, or AU$1,787), and is powered by an ARM processor, rather than Intel's Core i5 CPU. HP's Chromebook 11 weighs 2.3 pounds and comes with a webcam, two USB 2.0 ports, a full-size keyboard and trackpad and inbuilt speakers. You'll also get plenty of cloud storage on Google Drive - 100GB to be precise - which is yours for two years before you'll have to start coughing up a subscription fee. HP says it'll be available at the end of October in two different colours from Currys and other UK retailers. It'll be available in the US at the same time and can be ordered from Google's website. The stats say Chromebooks have been a failure, but should we listen to them?